Release Your Gifts! Easter Makes it Possible! Technology is about tools. While we associate technology with our modern, digital, age, the first stone cutting tools developed tens of thousands of years ago, as well as today’s simple pair of scissors all describe the tools used to accomplish work. Tech has undoubtedly become more powerful and accessible since 1455! 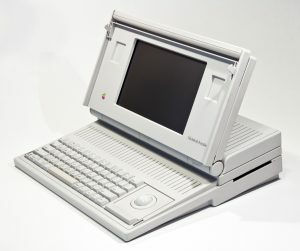 Comparing technology in the 1980s to today is still shocking to me. In 1983, I had the pleasure of teaching ten pastors at Bloomfield College, a Presbyterian Church (U.S.A.)-related school, while a pastor of a nearby congregation. I titled my course Ministers and Micros. Dragging their latest technology into the classroom underscored the students’ commitment. 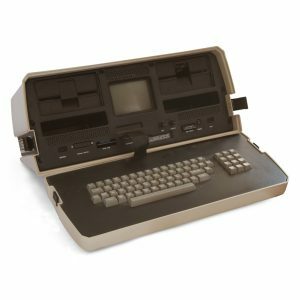 The Osborne 1, a popular portable computer at the time, weighed in at 23 lbs.! I still recall the memory of the Rev. Ronald Johnson every week lugging his Compaq portable up flights of stairs and placing it on one of the classroom’s tiny desks. Power cords were everywhere since none of these early “portables” had long-lasting batteries! As a class of ministry trailblazers, we helped each other learn how to use the best available tech and techniques to produce the best ministry outcomes. That class was important because church leaders have a responsibility to access and effectively use the best available technology to connect God’s love to the world. Gutenberg said, we must not allow “truth to be imprisoned” but released! Tools release God’s gifts! Leaders in every walk of life, from the small business to the shore boutique, from nonprofits to community groups, have a similar responsibly today. Use the best available tools to release our best gifts. We are the sharers of the Good News! Content creators, network builders, storytellers, producers and directors, elders and deacons, supervisors and staff, artists and designers, musicians and performers, community developers, doers of justice and workers for Christ’s peace, all leaders in the church. We use tools of theology, and master the tools of technology. In 1983, I referred to the intersection of theology and technology as TheoTech, and I believe the church now more than ever, needs to hang out at that same corner if the Good News of Jesus Christ is to widely seen and heard, and transform the lives of families and our neighborhoods! In Spring’s Eastertide, consider what your life would be like today if Jesus never burst forth alive from the tomb? What if the earliest women and men who witnessed the risen Lord didn’t make a way to share the story? What if the Gospels were never written, copied, and published around the world? 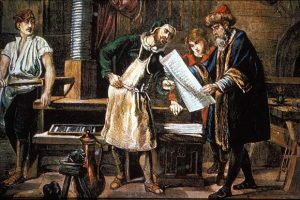 What impact would the Great Reformation have achieved without Gutenberg’s printing press? Imagine what would happen if a chick never broke through its shell? That’s what Easter is all about, breaking through shells of isolation, barriers, and disinterest. What would Cape May be like if Cold Spring Presbyterian Church remained inside its red brick church for 300 years? Well, our doors are open! Everyone is welcome inside in order that everyone is equipped to be sent outside to release their gifts! In person and online, from conversations across the street to advertisements in the Shoppe, we are releasing our gifts! And you, all of us, have gifts to offer! We all have TEA. Tea? Yes, an acronym that represents our Time, Energy, and Attention. Sunday, April 7, during worship after the Offering for Local Missions, I added Honoring Time, Energy, and Attention in the Neighborhood. I want us to briefly share what we have seen or heard, or what you have said or done, that has helped, blessed, or encouraged others. We don’t need names or circumstances, just brief portions of TEA? Did someone go out of their way to help? Have you witnessed anyone doing a special act of kindness? Maybe you visited someone feeling lonely, or on your Prayer Walk you prayed God’s blessings on who and what you encountered. Did you enjoy inviting someone to worship, or to dinner? It only takes a few minutes to inspire others to offer their own acts of kindness. In what ways do you release the “imprisoned” truth and “spread” the “public treasure” Gutenberg wrote about so passionately more than 600 years ago? What seals need to be “broken” so that we become transformative neighbors? Let’s focus our efforts together to release our gifts to boldly transform our community using tools of every kind to share the Greatest Story ever told! He is risen! 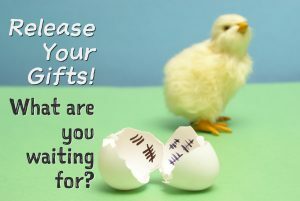 Release your gifts!